For some fish, the N.C. Division of Marine Fisheries limits the size and amount you can harvest. Local tackle shops have all the information you need about bag and size limits, or you can see the limits online at http://portal.ncdenr.org/web/mf/recreationalfishing. For example, a flounder must be at least 15 inches long to keep it; any fish shorter than that must be returned to the sea alive. Another example is striped bass; in the sound you are only allowed to keep three per person and only on certain days in certain seasons if the limit has not been met. It’s a little confusing to keep track of, but ignorance doesn’t mean you can bend the rules. If you are stopped with an illegal size or amount of fish you will be fined, no questions asked. So inform yourself before you go out Outer Banks fishing. Know, too, that many of the fish in local waters are not regulated and you can keep as many as you’d like of any size. Marine Fisheries agents are on the water all the time, and they can stop you and ask to search your coolers or live well. They can also ask to check your cooler at the boat ramp. And remember, it’s just good sportsmanship to never take more fish than you can use. Release any fish you won’t be able to eat. A saltwater fishing license is required for all Outer Banks fishing, in all waters. You can purchase one online at www.ncwildlife.org or from local tackle shops. Fishing in the northern Currituck Sound is considered freshwater fishing and therefore requires a freshwater fishing license. Licenses are available at tackle shops, Wal-Mart, Kmart and at the Outer Banks Center for Wildlife Education at Currituck Heritage Park in Corolla. You will have no problem finding out where those fiesty fish are since there are a lot of Outer Banks fishing reports online and on the radio. Piers do them, tackle shops do them, private groups do them. OK, so you know you need a rod and reel, line, hooks and weights, but what kind? There are different rods and reels for different kinds of Outer Banks fishing, the most common being surf-casting rods, trolling rods, light-tackle spinning rods and fly rods along with bait-casting (open-face) reels, spinning reels and fly reels. There are also several types of hooks and rigs, but the most commonly used and most versatile is the bottom rig. The bottom rig is weighted so that it sits on the bottom while the bait dangles above it. If you’re not sure what to use, go for the bottom rig. Get a variety of weight sizes because the amount you’ll need varies depending on the amount of current flowing where you’re fishing. If your weight won’t hold on the bottom, switch to a heavier one. Fishing line comes in pound test increments, which essentially means the amount of tension the line can bear before it breaks. If you know absolutely nothing about fishing, the best thing to do is to consult a tackle shop for advice. Tell them where you plan to fish and they’ll help you decide what type of rod, reel, line, hooks, etc. you’ll need. Many tackle shops and piers rent tackle, so if you don’t want to invest in fishing gear you’ll use only once a year, this is a good way to go. Should you use live bait, fresh or frozen bait or an artificial lure? It depends. Live bait works the best, but it’s the most expensive and it’s the most difficult to maintain when you’re out fishing. Fresh bait, like shrimp or cut mullet is next best, then frozen bait, like shrimp or squid. Artificial lures require a little more technique, but they’re always at the ready and they don’t rot in the sun. Depending on where you’re fishing when, the type of bait or lure you use will vary. Again, tackle shops are the best sources of information for finding the bait or lure that will yield the best results for the type of fishing you’re planning to do. The bite is definitely affected by tide, wind direction and time of day. Again, ask at your chosen tackle shop about the best tides, times and wind/weather conditions for your chosen type of Outer Banks fishing. If it all seems like too much to keep track of, don’t worry about it and just go out and have fun! More often than not, if you stay out long enough, the conditions will line up at some point and you’ll catch something. This is a great way to fish if you’re new to fishing or if you don’t have all the tackle you need. Head boats are large boats that take out a lot of people at once, and they provide all the bait and tackle, plus a helpful mate. 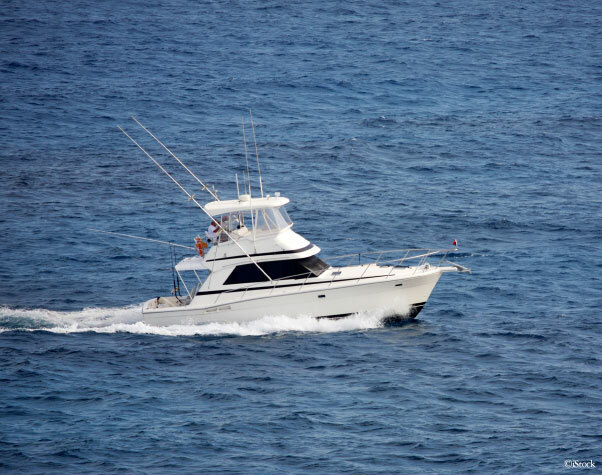 Head boats take passengers on bottom-fishing trips either in the sound or in the near-shore ocean waters and wrecks. Head boats are great for kids because there are restrooms and snacks on board. There are more than 100 miles where you can cast a line for Outer Banks surf fishing – for free. All you need is a surf rod and some bait. If you’re using frozen bait, be sure to bring a cooler to store it in. Not only will it rot in the sun, but birds and dogs will be attracted to it. You may also want to use a rod holder; that way you’ll never have to lay your rod and reel down in the sand. 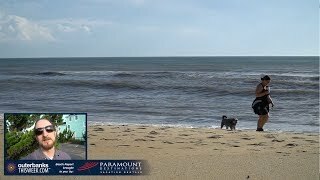 Surf anglers with four-wheel-drive vehicles can drive right out onto on the beach in certain areas of Cape Hatteras National Seashore, but be very clear about the areas that are closed due to wildlife habitat. This makes it really easy to get all your gear to the beach and find the best spot. You can pick up an Off-Road Driving Map at any of the National Park Service visitor centers. A pier can get you out into the deep-water fishing grounds for an inexpensive price and without the hassle of a boat. 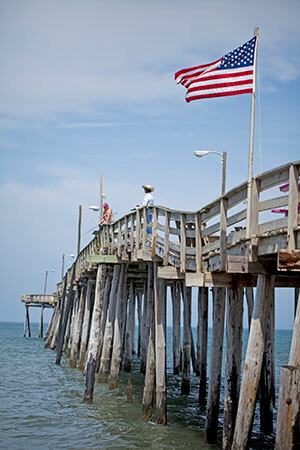 There are several Outer Banks fishing piers from Kitty Hawk down to Hatteras Island, and they all have bait and tackle shops. Some of the shops rent fishing gear so you don’t have to go out and buy it. All of the pier-house staffs offer expert advice on what’s biting and how to catch it. Many species of fish are attracted to structure, which is why you often see anglers hanging around bridge pilings. If you have access to a boat, it’s easy to motor up to bridge pilings to fish. But even without a boat, you can still access some Outer Banks bridges. Herbert Bonner Bridge On the southern end of the Herbert Bonner Bridge over Oregon Inlet is a “catwalk,” a dedicated fishing walkway that is separate from the roadway and therefore safe for anglers. Park in the parking lot on the southern end of the bridge. Washington Baum Bridge This bridge spans the channel between Roanoke Island and Nags Head. Underneath the west end is a nice pier and dock. The access area and parking lot is just across the street from Pirate’s Cove Marina. Nags Head Causeway Bridge Also known as “The Little Bridge,” this bridge has side walkways that make it easy for anglers to fish in the Roanoke Sound. It’s a good fishing spot and is often crowded with anglers. If you really want to increase your odds of catching a fish, it pays to hire a guide. These are people who are out on the water every day, and they know where the fish are and how to catch them. Inshore guides typically fish in the sounds, inlets or near-shore waters and offer light-tackle or fly-fishing trips. They’ll take you out for a half day or a full day. You can find an inshore guide through a tackle shop or a marina (see the list below). If you’re new to fishing, tell that to the booking agent, and they will be able to recommend a guide who is skilled at instructing new anglers. 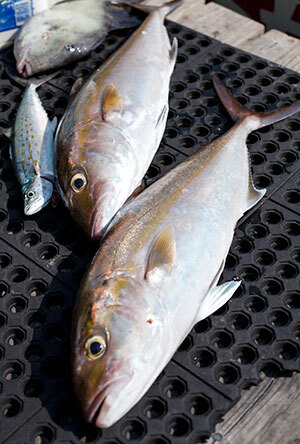 This is the big-time fishing the Outer Banks is known for. Off-shore fishing means heading out to sea to the Gulf Stream, where giant species of fish like billfish, tuna and dolphin lurk. Off-shore charter boats are big business on the Outer Banks, and they command at least $1,500 a day plus a tip for the mate. However, the boats can take up to six anglers per trip, so if you divide the cost among six people it doesn’t seem so outrageous. Because the journey to the Gulf Stream is at least an hour, sometimes more, off-shore charters last a full day, starting at around 5 a.m. All you need to bring is food, drinks, sunscreen and seasickness remedies; the captain and mate supply everything else and offer any instruction you need. You can book an off-shore charter through one of the local marinas (see the list below). Charter boats are located close to the inlets for easy access to the ocean; since there are no inlets on the northern Outer Banks there are no charter boats there either. 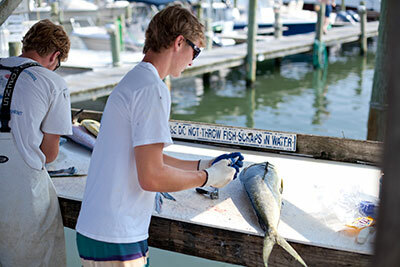 See our charter fishing section for a full list of the Outer Banks Marinas.